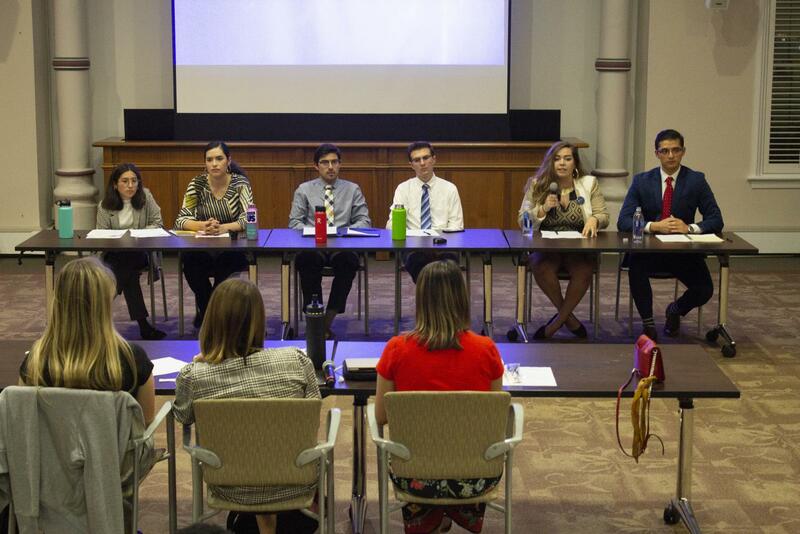 2019 SGA candidates debated to introduce their platforms. Voting begins April 8. The Student Government Association held a debate for the candidates for Senate, President and Vice President April 3. Voting will begin April 8 and last until 5 p.m. April 12 and be conducted through collegiatelink. Over 70 students were in the audience for the debate, which lasted over an hour. The debate, which over 70 students attended, featured the four presidential/vice presidential candidates answering questions from moderators and students. Junior AJ Valverde and sophomore Connor Schee participated in the debate, but later told Hilltop Views that they are no longer running. Topics ranged from the candidates’ choice of their running mates to how they plan to go about solving problems. “It’s getting out of the SGA bubble and collaborating with different organizations is what is going to ultimately change the reputation of SGA,” presidential candidate Leslie Rios said. Official campaigning for open Senate positions and the presidency began last Monday, April 1. The campaign of junior Oscar Parra and sophomore Jessica Riley was suspended from campaigning for two and a half days. The Election Commission ruled that they violated the rule prohibiting candidates from campaigning ahead, before April 1. “Our photographer, part of the campaign staff, posted a photo on social media. Someone saw it and reported it to the elections commissioner and it was deemed as campaigning,” senior Derek Hunter said. Hunter is the campaign manager for the Parra/Riley ticket and the current Chief Financial Officer of SGA. They successfully appealed their suspension and it was reduced from the typical penalty of four days. Candidates will be tabling outside Moody Hall every weekday from 11 a.m. till 1 p.m. until the elections are over. Both presidential tickets have campaign plans in addition to these hours, however. Both presidential candidates have previous experience in SGA. Parra currently serves as the Deputy Chief Financial Officer under Hunter, and Rios is the current Vice President. Rios hopes that her campus involvement and experience will persuade students and allow her to achieve her goals for the office. Rios’ running mate is sophomore Athina Castanon, who is currently a Senator. Castonon believes that their community involvement makes them strong candidates. Parra and Riley have focused their platform on improving communication between the student body and SGA. They want to push SGA members to speak to students directly instead of waiting for the students to reach out to SGA members through forms. “The first step is inclusion. We need to be more active and consistent in the events and the ways that we reach out to the student body,” Riley said. A link to the voting will be posted to the SGA Instagram account on April 8, according to SGA President Joanna Ariola. SGA will host an election party on Ragsdale Lawn from 4:30 to 5:30 on the final day of voting.